The standard models of guitars use the same overall dimensions yet the woods used differ. A standard model's top is made from either European or Englemen Spruce or Red Cedar. The back and sides can be made from various woods such as Brazilian Rosewood, Honduras Rosewood, East Indian Rosewood or Spanish Cypress. The neck wood is always constructed from Spanish Cedar, reinforced with a hidden graphite bar. The finger board uses Ebony. 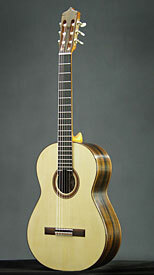 The bridge is made from Brazilian Rosewood. These are the various woods used in a standard model, resulting in a difference in tone and price. For further information on the standard models, please follow the links above and contact me if you have any questions or need more information on the guitars. This limited edition series of eight guitars was a celebration of my 35th year of lutherie. These special guitars were all be made from ancient woods that I had been collecting for thirty-five years. Some up to 275 years old! For much more information please contact me. I often have one or two used guitars in the shop. For more information, please send an e-mail to dake@traphagenguitars.com or call 360.671.1017.